This is Essendon Football Club’s night-of-nights. The Crichton Medal is an evening of celebration and adulation, where our Club’s Best & Fairest player is honoured in front of around 1,400 supporters. With all Essendon players and coaching staff in attendance, it is a rare opportunity to join the football department to let down your hair and reflect on the year that was. 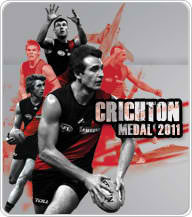 Always a sold-out event, the Crichton Medal is not to be missed. This entry was posted in Bombers News, Events. Bookmark the permalink.